From the compact, low flow 003 to the high-head 0013, there's a Taco Circulator to fit your residential or light commercial application. Installation is quick and easy, and maintenance is a snap. With no mechanical seal, the self-lubricating design provides unmatched reliability. 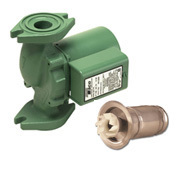 Every 00® pump features a field-replaceable cartridge that contains all the moving parts. IFC® Cartridge Circulators feature an Integral Flow Check, eliminating additional installation costs associated with separate in-line flow checks. The IFC® also improves system performance and is easy to maintain.